It started out so simple – a venn diagram with just two circles. I started it because I specialize in making complex information surveyable. The idea came from a chart I maintained years ago when I was a Product Planning Manager for DVD Recorders at Philips Consumer Electronics, in the middle of the battle between DVD+RW, DVD-RW and DVD-RAM. Note we’re talking here specifically about HDR video, because HDR in still photography usually means something different; a set of techniques that typically still results in an SDR image that can be displayed on an SDR screen. Techniques typically based on exposure synthesis, enhanced with proprietary techniques such as Apple Smart HDR and Google HDR+. Beware of that latter name; there are several companies using “HDR+” for very different things. The only true HDR technologies for still images are Dolby’s JPEG-HDR and the technology Netflix has come up with for using HDR in still images in their on-screen menus. Enough about stills now. And then there’s a sixth one, PQ10. It’s often overlooked. Why? Because most companies in this ecosystem don’t talk about it. I’ve never come across a TV brand claiming to support PQ10 for instance, even though they will. What is PQ10? It’s HDR10 without metadata. Can this work well? Sure. It’s even very practical, especially for broadcast. The issue with HDR10 is that it’s specified what the static metadata has to look like but not what should be done with it. 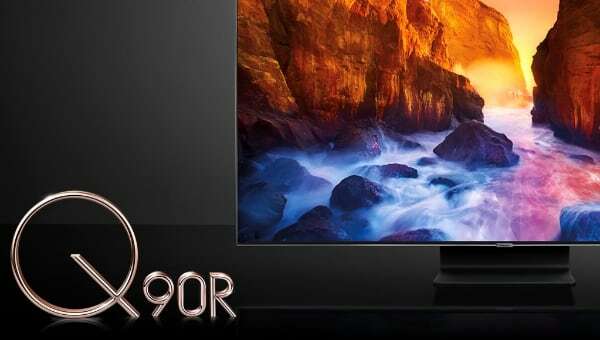 A TV may ignore the HDR10 metadata completely. More about that here. 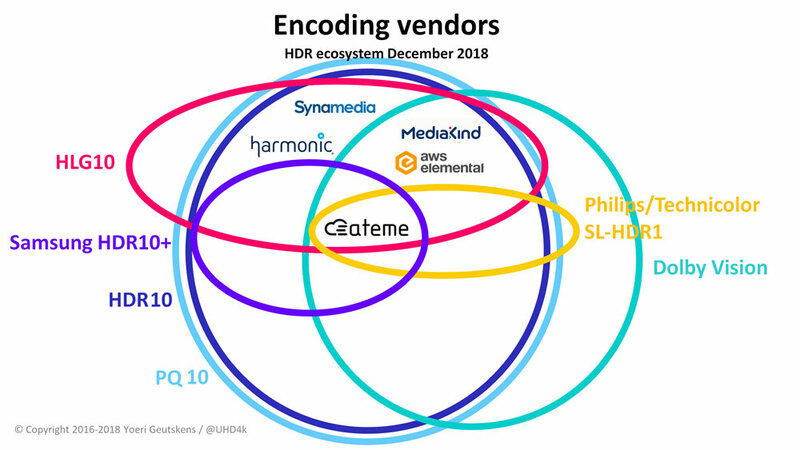 One segment of the ecosystem that does distinguish PQ10 explicitly is encoding vendors, which is why you’ll find six circles in that diagram. There’s much more to tell about these formats but I won’t do that here. I do that in The State of HDR. I want to emphasize once more that in my view, there is no format war between HDR video formats. A broadcaster typically needs to choose a single format but for just about any other party in the content delivery chain, multi-format support is highly feasible. Consumers should not need to choose one format over another so it’s up to TV makers to make sure they offer as many formats as possible – preferably all. This part of the ecosystem needs a bit more explaining for two reasons. The main one is the distinction between TV brands and TV manufacturers. This chart mixes both, to some extent. A lot of TV sets are no longer made by the company whose brand you find on it. TV manufacturing is a cut-throat competitive business with razor-thin margins, so a lot of the traditional consumer electronics companies have outsourced this, often to such an extent that they’ve completely withdrawn and merely collect royalties from a brand license deal. I’m avoiding the term ‘OEM’ (Original Equipment Manufacturer) here because it’s an ambiguous word, sometimes applied to the brand licensor, sometimes to the licensee. This brand ownership or licensing changes from time to time. Foxconn, which bought Japanese company Sharp, is suing Hisense, to whom Sharp sold its US subsidiary and branding rights before getting bought by Foxconn. Where this chart mentions Vestel, that means both the Vestel brand and the Toshiba-branded TV sets in Europe. ‘Toshiba’ in this chart means Toshiba proper, the Japanese mother company. You won’t find Philips in this chart, just P&F USA and TP Vision. 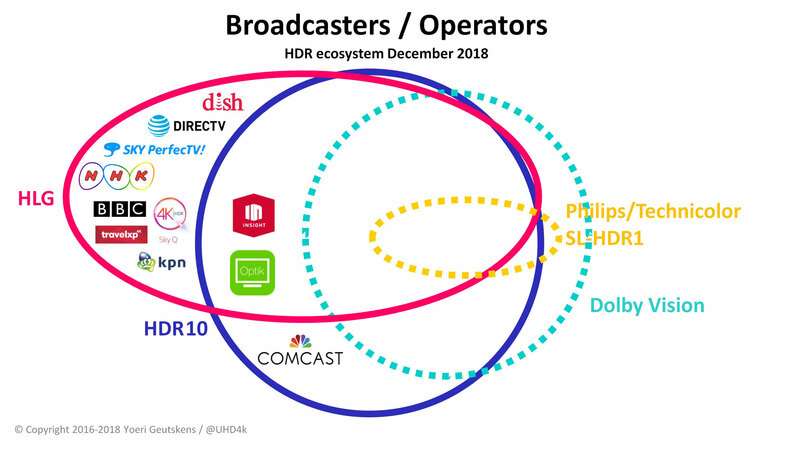 Sharp in this chart currently gives the situation for USA where (some of) their sets support HDR10 and Dolby Vision. The manufacturer is Hisense but they also release products under the Hisense brand. In Europe, the Sharp brand is barely present in the TV market. Sharps sets in Europe (mainly UK actually) seem to support HDR10 only. 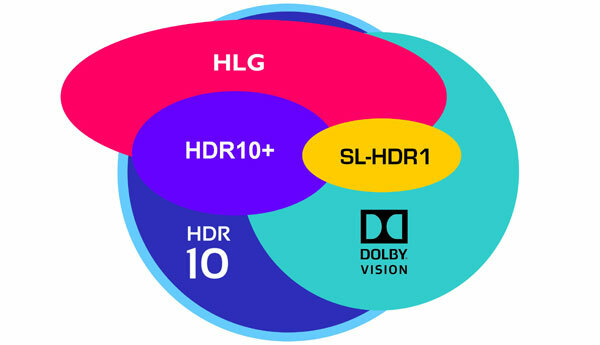 In Japan, their products support both HDR10 and HLG. For all brands that are used only in one region, I’ve used the brand rather than the manufacturer’s logo, e.g. Grundig, RCA, Westinghouse, Polaroid, Kodak. A perhaps more elegant solution that I’m considering for a future update is to have separate versions of the TV brand chart for each key market. Newly included for the first time in this diagram are Insignia (a Best Buy brand), Westinghouse, RCA (USA), JVC TVs (the former entry with HDR10 and HLG reflected projectors, no longer included here), Sharp, Hitachi, Funai (Japan), Electriq (UK), Konka (China), Polaroid, Kodak (India). Bear in mind that when a certain TV brand is listed here under HDR10 and Dolby Vision for instance, it does not mean that all of their TV sets necessarily support these features. Clearly, HDR10 is the most widely supported format, and Dolby Vision is also very popular. Fewer brands (claim to) support HLG, and even fewer HDR10plus or Technicolor ‘Advanced HDR’. Samsung has never officially stated to support HLG but there’s ample evidence from users that it does. I’ve specifically put the HDR10plus ellipse inside of the HDR10 one, to visualize that every TV that supports HDR10plus necessarily also supports HDR10. 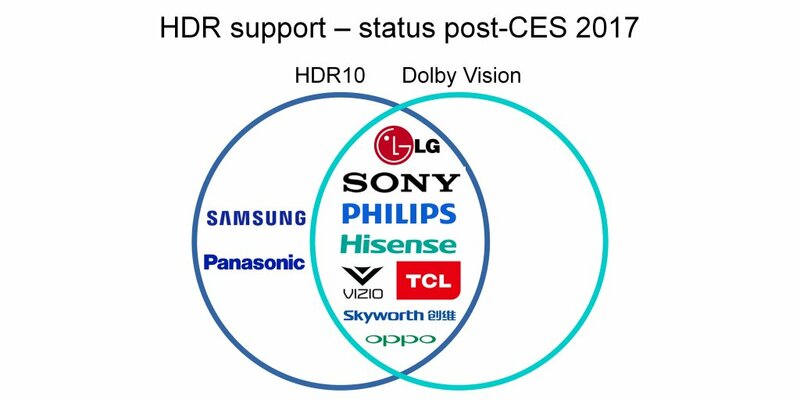 This chart also suggests that every product that support Dolby Vision supports HDR10 as well. In practice, that is the case now, but early on Vizio TV sets and the Vudu streaming service were in the Dolby Vision-only part. 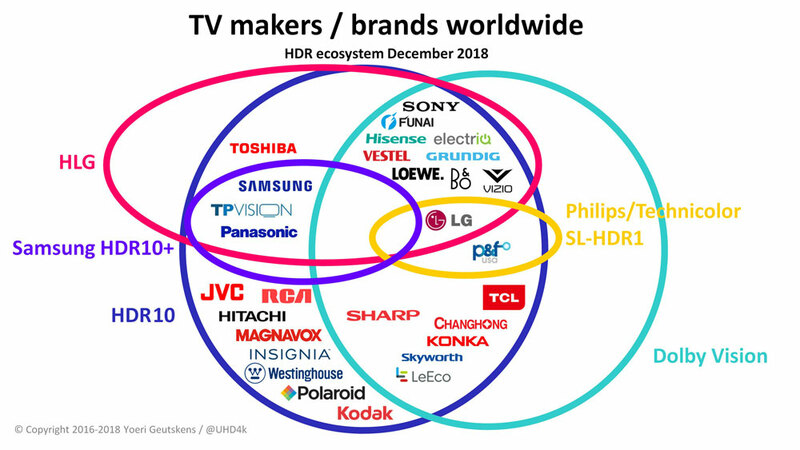 What’s also striking here is that there is no TV brand supporting all five formats yet (though Philips would be, if we conflated TP Vision and P&F USA). LG has got the broadest HDR support but one wonders if they’ll every support arch rival Samsung’s HDR10plus. 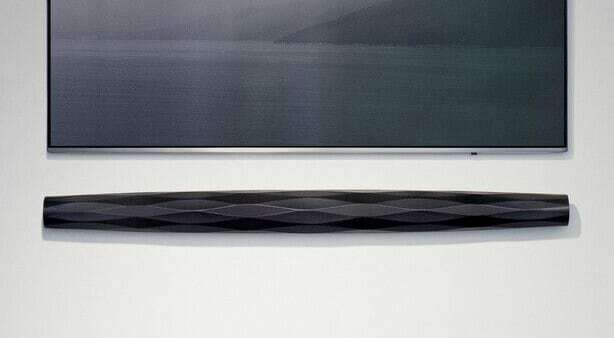 While universal HDR support would be a strong selling point, the first such TV product has yet to be announced. Perhaps CES 2019 will bring us such news. As you can see in the SoC chart further down, chipsets supporting all flavours already exist. What has held back universal HDR support in TV sets, according to the chipset makers, is the wait for HDMI 2.1. Does every TV brand sell HDR TVs now? Almost, it seems, but there are still budget brands that don’t, such as Sceptre. 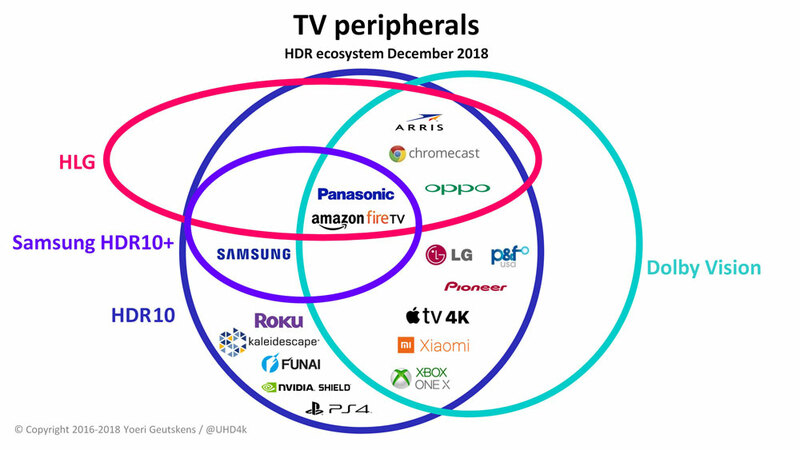 By TV peripherals I mean source devices, notably streaming media players, games consoles and Ultra HD Blu-ray players (Oppo, Pioneer, LG, Panasonic). 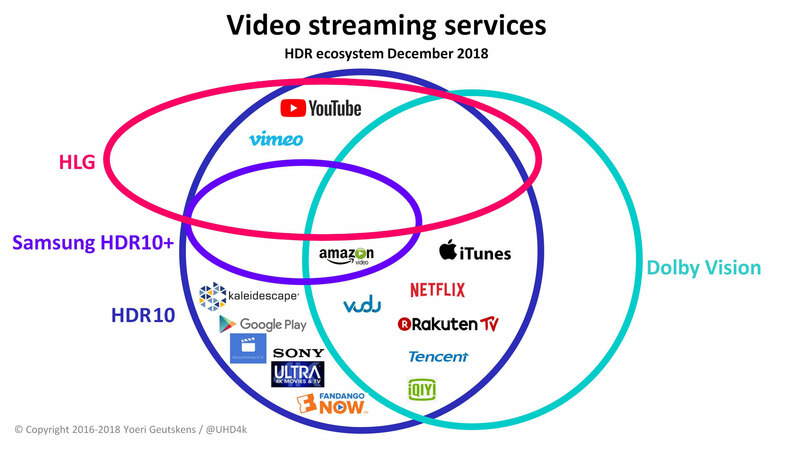 I might add set-top boxes here but apart from Arris (HDR10, HLG and Dolby Vision) I have yet to sort out what formats STB makers such as Technicolor, Amino and Kaon support. 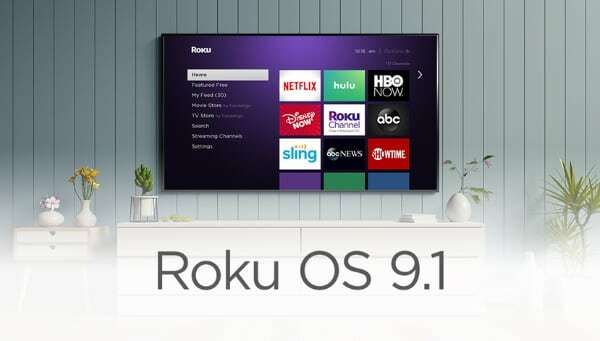 A few notes: Roku’s platform can handle Dolby Vision but for some reason they haven’t enabled that in any of their standalone products (the boxes and sticks), they only have in Roku-powered TV sets by brands such as TCL, Hisense, Sharp and Philips, which you’ll find in the TV brand chart. Not all Roku-powered TVs feature Dolby Vision – RCA, Hitachi and Insignia only work with HDR10. Insignia’s latest TVs are based on Amazon’s Fire TV platform. According to a firmware leak, Apple TV 4K is HLG-compatible but until Apple is ready to talk about that I’ll leave that detail out. Note Panasonic’s special position here: Unlike their TV sets, their top-of-the-range UHD BD player does support Dolby Vision. Clearly they recognized that you cannot sell a credible high-end disc spinner without DV. 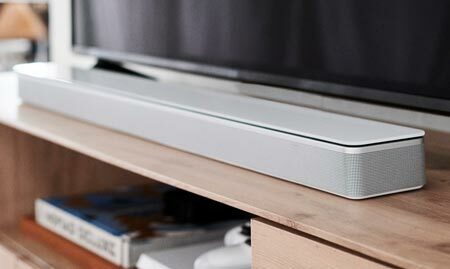 And while the Ultra HD Blu-ray disc format does not have HLG as one of its optional formats (only HDR10, Dolby Vision, HDR10plus and Philips HDR), the Oppo and Panasonic do support it, for streaming files from, for instance, USB drives. 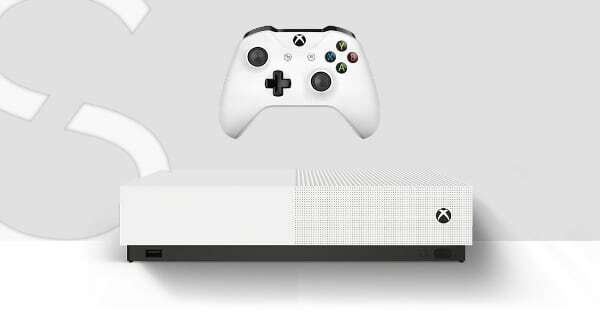 The Xbox One X recently added Dolby Vision, but to what extent that extends to Ultra HD Blu-ray playback is not clear. Products that are not HDR-compatible I have not included here. Perhaps I should – outside of the circles. Prime example: Nintendo Switch. The OTT video chart is quite self-explanatory. I’ve already highlighted the mismatch between the formats supported by streaming services and streaming devices of the big companies – Google Play and Chromecast do not support the same HDR formats; the same was true for Amazon Prime Video and Fire TV until recently, but things are improving. In the meantime I’ve added ‘Microsoft Movies & TV’ (this is the blue icon with the clapper, in case you can’t read the text). This service runs on Xbox One S/X, and again there’s a slight mismatch here. Apple’s got it right: iTunes supports the same types of HDR (and Dolby Atmos) as Apple TV 4K. ‘ULTRA’ is Sony’s 4K video streaming service that’s only available in the US, and only on Sony Bravia Smart TVs – not on PS4, not even Pro. Tencent and iQIYI are from China. Vimeo doesn't support HLG for playback but it does for uploading, after which it converts the HLG to HDR10. YouTube does offer HLG playback with VP9. The next chart offers a very different picture. As you can see, HLG is by far the most popular format among broadcasters, and not just in Japan. Insight TV’s position here is not entirely fair, as the broadcasts are only in HLG; it’s the VoD service that uses HDR10. Sky Q here reflects the situation in Italy. In the UK, Germany and Austria HDR broadcasts have yet to start. These will probably begin in 2019. Canadian operator Telus says its Optik TV service offers HLG as well as HDR10. No broadcasts yet in Dolby Vision, although BT has done a live trial in 2017. No SL-HDR1 broadcasts either yet, although some broadcasters use this format in their workflow before the playout stage. Because I expect these formats to get used in the future I’ve drawn them with dotted lines here. Perhaps HDR10plus has to be added here as well, since Samsung has begun writing proposals for it to be used in ATSC 3.0 and DVB. The movie studio diagram looks a little silly perhaps. Thankfully there’s only one HDR format for theatrical movies and that’s Dolby’s. Dolby Vision for digital cinema is not offered separately but as part of Dolby Cinema, where it’s combined with Dolby Atmos sound and several theater design requirements defined by Dolby Labs. All major studios support Dolby Cinema and release movies for it. 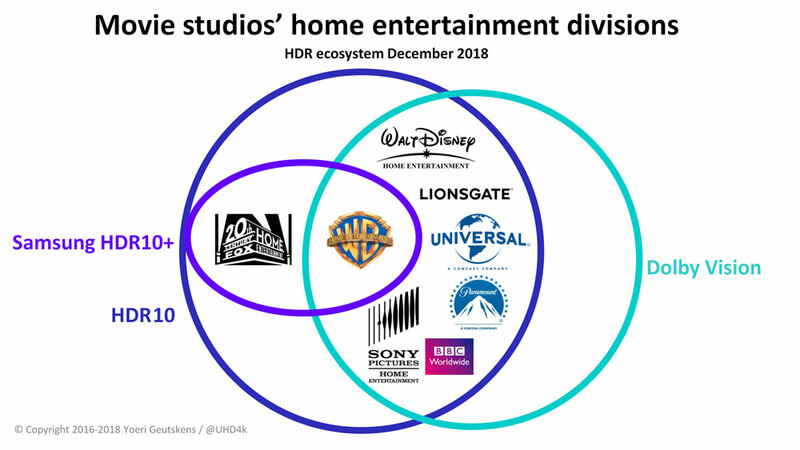 The reason I’ve included this graphic is to show some interesting differences where it comes to the policies of these studios’ home entertainment divisions. For home movies, three formats are relevant at the moment. 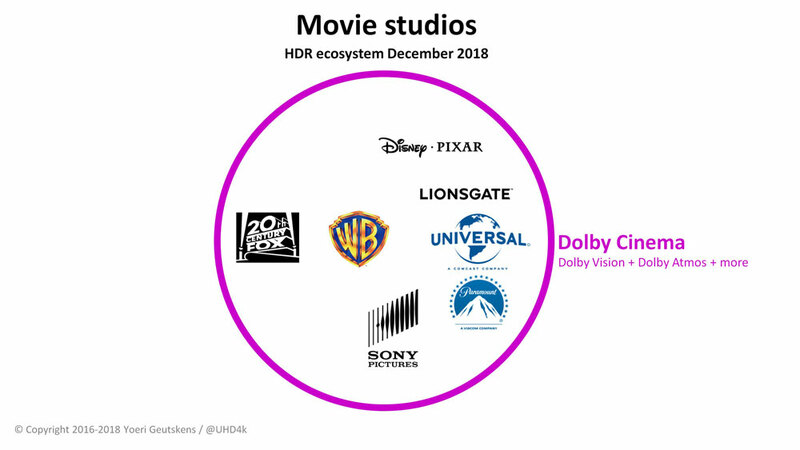 All studios’ labels support both HDR10 and Dolby Vision for home releases, except 20th Century Fox. They do not use Dolby Vision (nor Dolby Atmos, for that matter), even for releases that were Dolby Cinema in the theater. Warner Bros Home Entertainment says it will support HDR10plus in addition, though they have not yet released any such title on disc or on the streaming platforms. Added here is BBC Worldwide – the home video distribution arm of the British Broadcasting Corporation. While the broadcaster obviously uses its own invention HLG, this is not one of the optional formats on Ultra HD Blu-ray, so the distributor pragmatically uses HDR10 and Dolby Vision for its beautiful wildlife documentaries. Where it comes to silicon, the picture is quite simple. All logos are highly concentrated. Some chip makers have reached universal HDR support, others are close to it. As noted before, what has kept TV makers from offering universal HDR support until now is, according to some of these companies, the lack of HDMI 2.1. Expect that to get solved in 2019. The chipsets we’re talking about here are the ones that drive the TV sets and other display devices, but also the STBs, streaming media players, etc. Lastly, an important role in the whole delivery chain is played by the vendors of encoding systems and services. I’m not talking about chips or software packages for a single video file on a PC but products that let operators or streaming service providers encode lots of channels or files simultaneously. This is for now the only segment where product offerings specifically mention PQ10, hence the extra circle. They all support PQ10 as well as HDR10 and HLG. Support for Dolby Vision and HDR10plus is more limited though no doubt the companies are working on this, based on customer priorities. 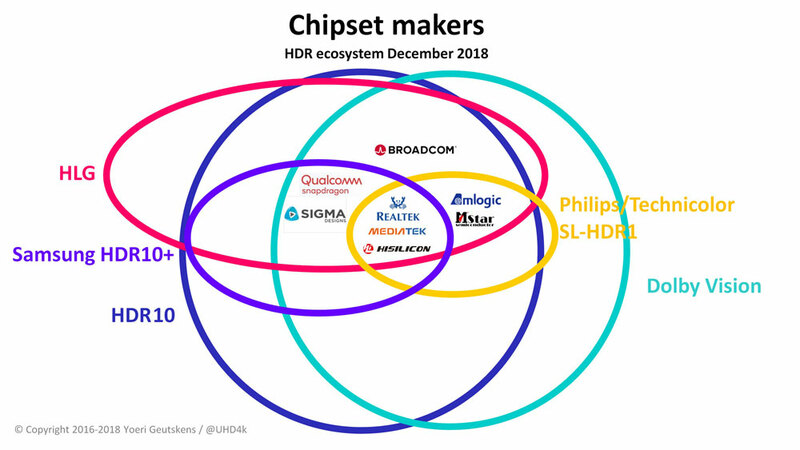 If some of the names here are unfamiliar, note that MediaKind is Ericsson’s recently spun-out media division while Synamedia is Cisco’s recently spun-out video service provider business. In future articles and postings on Twitter and LinkedIn I will go further into what all this means. For instance the pronounced differences in HDR support for TVs in different regions. And what the disparity in HLG support between broadcasters and TV makers means. Stay tuned. Yoeri Geutskens has worked in consumer electronics for more than 15 years. He writes about high-resolution audio and video. You can find his blog about Ultra HD and 4K at @UHD4k and @UltraHDBluray. 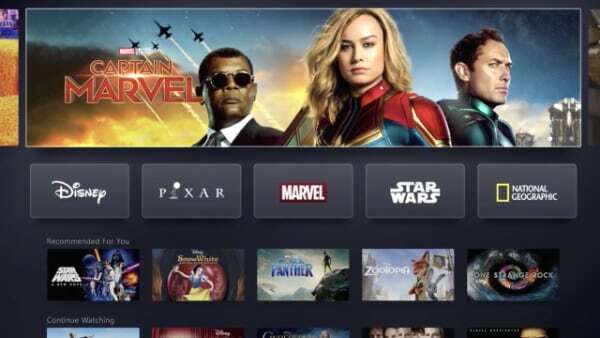 20th Century Fox, Amazon Fire TV, Amazon Prime Video, Amlogic, Apple iTunes, Apple TV 4K, Arcelik, Ateme, AWS Elemental, BBC Worldwide, B&O (Bang & Olufsen), Beko, Broadcom, Changhong, Chromecast, Cisco, Comcast, Curtis International, DirecTV, Dish, Disney Pixar, Dolby Labs, Electriq, Empire Electronics, Ericsson, Fandango Now, Funai, Google Play, Grundig, Harmonic Inc, Hitachi, Hisense, Hisilicon, Insignia, Insight TV, iQiYi, JVC, Kaleidescape, Kodak, Konka, KPN, Le Eco, LG, Lionsgate, Loewe, Magnavox, Mediakind, Mediatek, Microsoft Movies & TV, MStar Semiconductor, MTC, NBC, Netflix, NHK, Nvidia Shield, Oppo Digital, Panasonic, Paramount Pictures, P&F USA, Philips, Pioneer, PlayStation 4, Polaroid, Qualcomm Snapdragon, Rakuten.TV, RCA, Realtek, Roku, Sceptre, Sharp, Sigma Designs, Sky Q, Synamedia, TCL, Tencent, TP Vision, Samsung, SkyPerfecTV, Skyworth, Sony Pictures, SPPL (Super Plastronics), Synamedia, Technicolor, Telus Optik TV, Tongfang, Toshiba, Travelxp 4K, ULTRA, UMC, Universal Pictures, Vestel, Vimeo, Vizio, V-Silicon, Vudu, Walt Disney Home Entertainment, Warner Bros, Westinghouse, Xbox One S/X, Xiaomi Mi, YouTube. The Perceptual Quantizer was developed by Dolby and standardized as SMPTE ST 2084. HDR10, based on PQ, with SMPTE ST 2086 static metadata, plus two parameters added by the BDA (Blu-ray Disc Association), MaxFALL (Maximum Frame Average Light Level) and MaxCLL (Maximum Content Light Level). Dolby Vision, based on SMPTE ST 2094-10 dynamic metadata. Philips/Technicolor HDR, initially based on SMPTE ST 2094-20 and ST 2094-30, respectively, but now described in standard ETSI TS 103 433-1. Listed in these charts is SL-HDR1 but there is also SL-HDR2 and -3. HDR10plus, developed by Samsung, described in SMPTE ST 2094-40. HLG , short for Hybrid Log Gamma, developed by BBC and NHK; in practice this will typically be HLG10, described in Rec. ITU-R BT.2100.